The parks, the banks of the Thames, everywhere there are green spaces there are thousands of daffodils. The botanic name for these flowers is Narcissus. In Greek mythology the young Narcissus was so obsessed with his own reflection in the water he either fell in and drowned or died of starvation sitting there. Choose your version. Either way this is the flower that sprang up where he died. Another story is the flower is named after its narcotic properties. As I was wandering around taking pictures of daffodils I drove my walking companion nuts trying to remember the words to Wordsworth's poem. Fluttering and dancing in the breeze. Tossing their heads in sprightly dance. In such a jocund company! And dances with the daffodils. thank you for this poem reminder. It has been years, no, eons. Both, the picture and the poem is beautiful! We still have so much snow. I feel the same ways about seeing my daffodils, tulips and wild mountain flowers! Thank you for the touch of Spring! I'm impressed you even tried to remember the words to the poem. I think I read it years ago and would never have remotely thought of it! I learned the Narcissus myth back in grade school and knew about the flowers, but I never knew they were daffodils! LOL. Learn something new everyday! And to answer your question on my blog: The Claretian Missionaries are a Roman Catholic order of priests founded by St. Anthony Claret in Spain. The Philippines was a Spanish colony for three centuries and one effect is that most Filipinos are Roman Catholic, or Christian, at least. Thanks for the beautiful poem , thousands of daffodils , i'm impressed , i have just a few in my tiny garden :)Nice shot ! The poem I always try to remember each year is A.A. Milne. And curtsied up and down. Thanks for sharing the photo and poem! They are my favorite flower, one that brings back childhood memories of spring's beginning and winter's end. Daffodils are out in full force in London!!! Some have even managed to grow in my garden, which is quite a miracle because it is a big shared house in which no body does the gardening! Jeremy Iron. Well,I can't compare, I know... Listen to him yourself! My favourite flower, my favourite poem. So beautiful. All the best. Ciao. A. Great spring photos today and Monday. Also great Shanghai photos. Also congrats on 400 post. Also happy belated birthday! I think thats everything I've missed. 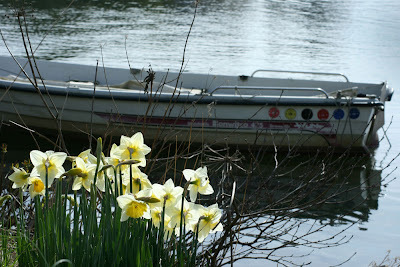 A great picture, with the boat anchoring the daffodils (or do they anchor the boat?) I've loved the Wordworth poem for many years, but I also thank Joelle for the A. A. Milne poem, which I don't remember. Such a nice springtime post! You certainly are ahead of us for greenery...we still have snow on the ground here. how nice to see daffodils and so much poetry to remind us of those who have experienced and enjoyed daffodils before us. I wish I was there walking the Thames and seeing these lovely flowers. And in answer to your question about the spa, it is a fabulous spa at the Fairmont. Actually we have lots of excellent spas in Scottsdale. We are so lucky to have so much around us to enjoy. we sometimes book spa days with friends and lounge at the pool, eat lunch by the pool, and end the day with treatments and champagne at the end of the day. this makes for a perfectly decadent day!